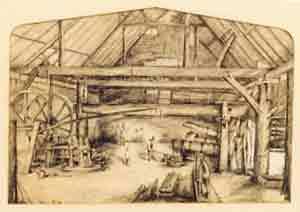 A sketch of Fontley Iron Mills, Hants, England, dated 1873, in the possession of a descendant of John and James Bartholomew. From the 1770s until 1789, Henry Cort owned the Iron Mill and forge at Fontley. In 1781, Cort entered into a partnership with Samuel Jellicoe whose share was paid by his father, Adam Jellicoe. By 1782 and 1783, Cort had been awarded patents on a new process for producing wrought iron called “puddling”, which he used at Fontley. In 1789 when Adam Jellicoe died, it became evident that he had used public funds to support development of Cort’s new process. In order to pay back the money that Cort owed the Crown, a court requisitioned the property at Fontley and another one at Gosport. Cort's partnership with Samuel Jellicoe was dissolved. Samuel Jellicoe subsequently was able to clear his debt and take over the properties. Henry Cort died a poor man in 1800. Jellicoe owned Fontley Iron Mill until it was sold in 1815 to John Bartholomew, who had worked for Henry Cort as a “finer”. John Bartholomew would have been about 60 years old in 1815. He was the grandfather of Ellen Mary Bartholomew’s father, James. Cara Shill states that both James’ Father (James) and Grandfather (John) were from Founders at Fontley near Fareham. “They ran the Iron Mills at Fontley, Fareham, the last of the privately owned iron mills”. In fact, Pigot’s Directory for 1828 had an ad for John Bartholomew and Sons, wrought iron manufacturers at Funtley Iron Works. By 1847, there is no longer any mention of them or the Iron Works. Following is the text of an old typewritten page in the possession of a descendant of the Bartholomew family. -Origin and date unknown. “My father was a marine store dealer, and used to send his old scrap-iron by road to a village called Funtley, between Romsey Abbey and Southampton, where there was an ancient iron mill, owned by a very old gentleman named Bartholomew. My father took me down to see the process of working the iron. As far as I can remember, the pieces were carefully packed in square heaps about a foot high and eighteen inches long. They were next placed in a large oven and heated white hot; then drawn out in the way a baker draws his bread; and slid along till underneath the large hammer. This hammer was worked by an old-fashioned waterwheel, which in turn worked from the hammer pond. When the lumps of iron came out of the oven, two men stood ready, each with a long bar of iron having cross handles at one end; the other was white hot. These they placed on the hot lump, and the first blow of the hammer welded it into a mass, and then they could turn it about to manipulate it. It was next beaten into ‘plate’ or ‘Bar’ just as was required. “This old hammer mill was in an out of the way corner of the Meon River, one bank of which is in the Parish of Titchfield. The part of the stream which was kept up to feed the mill wheel is still called the Hammer Pond. 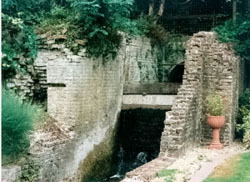 Photo of the Mill Race of Fontley Iron Mill taken 1995. 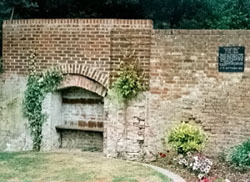 Remaining wall of Fontley Iron Mill with plaque honouring Henry Cort.